A stock market without volatility is like the Pacific Ocean without waves. At times, the surf can be gentle. At others, high tide with crashing waves can reach flood stage in low-lying coastal areas. The capital markets are constantly moving. During quiet periods, it’s important to remember that volatility is normal. History shows us that market pullbacks of 5% happen almost every three months, and 10% pullbacks typically occur once per year. Since 1980, the average intra-year drop is 14.2%. Despite this drop, the market ended the year positive 76% of the time. For every action, there’s a reaction. While Newton applied this law in the physical world, it also holds true in the realm of human emotion. When we perceive things aren’t going our way, we react. And when coping with seemingly unpredictable returns, knowledge and time can be our allies. Typically, returns over short periods of time have been quite unpredictable, but things tend to become less volatile when you expand the time horizon to five years or more. It’s important not to jump ship due to short term gyrations in the market. A solid financial plan should give investors the confidence to ride out the waves of volatility. Small frequent pullbacks or a large one from time to time can encourage market timing. However, investors should be careful. The worst and best days in the market tend to be clustered together. The best day of 2015 (August 26th) occurred only two days after the worst day (August 24th). The chart below illustrates the effects of missing some of best days in the market. This chart is for illustrative purposes only and does not represent the performance of any investment or group of investments. Source: J.P. Morgan Asset Management analysis using data from Bloomberg. Returns are based on the S&P 500 Total Return Index, an unmanaged, capitalization-weighted index that measures the performance of 500 large capitalization domestic stocks representing all major industries. Past performance is not indicative of future returns. An individual cannot invest directly in an index. Data as of December 31, 2016. Periods of market volatility – especially pullbacks – can trigger emotional responses in investors. You may feel upset or worried. It happens. And it’s normal. Volatility can also appear as rapid upswings causing sometimes-unbridled euphoria that can also impact judgment. It’s important to make sure your asset allocation matches your risk tolerance. We feel the number one rule for investors is to have a sound plan. When you get scared, remember the plan. If your goals didn’t change, you probably shouldn’t change your plan. If you have the urge to change your portfolio, lie down until that urge goes away or call your financial advisor. Engaged – Committed to your financial success with a hands-on investment planning and wealth management process. Transparent – We unwaveringly believe in the following: The advisor must eternally and indisputably be on the side of the client, always acting in the capacity of a fiduciary when providing investment advice; the client should be fully aware of the fee they are paying for advice; and the advisor should never be compensated in any other way for the investment advice. We never receive other compensation from third parties for investment advice. 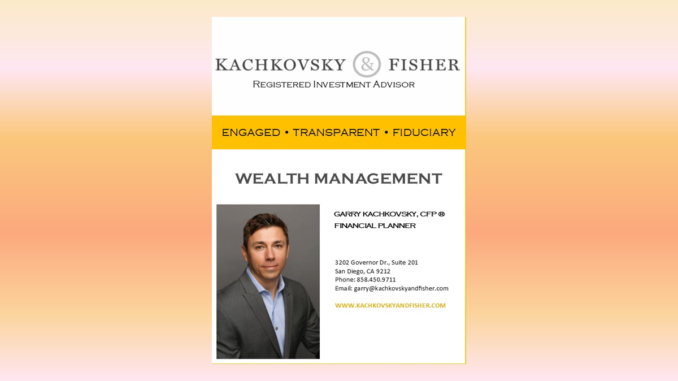 In keeping with our commitment to a fee-only practice, Kachkovsky & Fisher donates to charity 100% of any upfront commissions derived from its insurance practice, on products such as term life insurance, permanent life insurance, disability and long-term care insurance. Fiduciary – Under the Investment Advisor Act of 1940, an investment advisor has a fiduciary duty to clients – a fundamental obligation to always act in the clients’ best interests. In contrast to brokers, independent, fee-only RIAs are legally required to act as fiduciaries. Independent, fee-only advisors should also be more closely aligned with their clients because they are generally free from the conflicts, constraints and pressures that brokers face. Because we are independent, we are not bound to any specific investment products or family of funds. Whether you need assistance with retirement planning, a complicated tax situation, estate planning or borrowing, managing assets at multiple places, or intergenerational wealth transfer, we have the freedom to choose from a wide range of resources in order to tailor our advice based on what’s best for you. It is regrettable, however, that this is the exception rather than the norm in the financial services industry because the majority of advisors are brokers who are not required to act as fiduciaries and are not held to a “fiduciary” standard. Some advisors are also “dually registered.” This means they act as fiduciaries at times and at other times act as brokers who are compensated in different ways for investment advice. This can be problematic because you’ll need to determine whether any advice you receive is for your benefit or because they will receive a commission on the sale of a specific investment. July August 2017 Newsletter is now online!